The West Bletchley Garden Club has been in existence since 1998, and from small beginnings, goes from strength to strength. It was decided to broaden our catchment area by renaming as Bletchley Garden Club. Our membership continues to grow, now standing at around fifty but there is always plenty of room for new members. Why not join us? We meet on the evening of the second Tuesday of each month at Freeman Memorial Methodist Church Hall, Buckingham Road, Bletchley. During the summer months we participate in visits to gardens and nurseries. See our current programme on our '2017/2018 Programme' page. Over the years we have participated in the West Bletchley carnival, held in early June by hosting a stall which positively groans with member's lovingly-raised surplus plants for sale. We now also attend 'Love Bletchley' days.These are fund raising events which enables us to keep our subscription fees at a minimum. Monthly topics include many gardening aspects, including composting, beneficial insect and animal life, flower arranging, quizzes and slide show presentations from respected speakers from educational and institutional organisations and charities, including the National Trust, as well as summer and winter socials and private visits to various gardens, both local and more distant. Various day trips have been arranged including Kew Gardens, Garden Organic (formally known as Henry Doubleday Research Association) at Ryton and also to Wisley RHS gardens plus Birmingham Botanical Gardens for members and their guests. All these have been sellout successes. New trips are being planned for summer 2017. In 2009 we inaugurated 'The First Bletchley Seed Swap' event where gardeners and other interested people could bring and swap 'home collected' or surplus bought seeds, or just take away seeds to grow for a small donation. 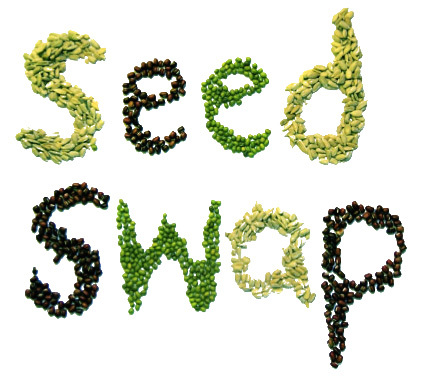 Carrying on from the success of this, we have been holding seed swaps every year since. We first held seed swaps at our Bletchley base and these have proved very popular. Homegrown collected seeds or surplus bought seeds can be swapped. Plants, plus hot and cold refreshments are available too. Freeman Memorial Methodist Church Hall, Buckingham Road, Bletchley. During the summer months we escape and venture to local gardens and plant nurseries. Directions can be found on our 'Directions' page. and the Windmill Hill Garden and Allotment Association (see links) to host a recording of this programme. The recording took place at Stantonbury Theatre on the 11th February 2013. We are sure everyone enjoyed being there and we received many complimentary comments and thanks.